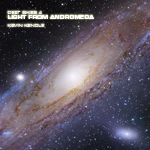 LIGHT FROM ANDROMEDA is the fourth release in Kevin Kendle's highly-acclaimed Deep Skies series of spacemusic albums. Inspired by the awe-inspiring Andromeda Galaxy, also known as M31, this music continues the journey far into deep space, carried along on a vast expanse of ethereal, drifting sound, where atmosphere and texture take the place of melody to enable the mind to truly wander freely. Below are preview MP3 clips of the music from Light From Andromeda - click the links to listen to these exquisite, ethereal sounds!